NEW YORK -- A mistrial was declared on Tuesday in the New York City racketeering trial of a notorious Philadelphia mob boss who had insisted he quit his life of crime after a lengthy prison term. Jurors at the trial of Joseph "Skinny Joey" Merlino told U.S. District Judge Richard Sullivan in a series of five notes that they were hopelessly deadlocked after nearly four days of deliberations. "Thank God for the jury," a subdued Merlino told reporters afterward. He declined further comment. There was no word from the government on whether it would seek another trial. Prosecutors had alleged that instead of retiring, Merlino muscled his way into gambling and health insurance schemes run by crime families on the East Coast. He used his standing as a feared figure in the Mafia to demand protection payments from bookies and other underlings running a scheme to collect thousands of dollars of insurance claims by bribing doctors to write phony pain cream prescriptions for people who had no ailments, prosecutors said. "Being with Merlino did not come for free," Assistant U.S. Attorney Lauren Schorr said during closing arguments. "You pay tribute." Defense attorney Edwin Jacob countered by telling jurors that they were being misled by "compromised" turncoat mobsters who testified against Merlino, including one who made hundreds of hours of secret recordings of him. "Have you heard anybody say Joseph Merlino is the boss of the Philadelphia mob?" Jacobs asked, referring to tapes played for the jury. "The answer is obvious - not a peep that he's the boss of (the) Philadelphia mob." But prosecutors argued the tapes showed Merlino had full knowledge of the frauds. In one conversation played for the jury about bribing doctors, he is heard saying, "We do the right thing, make 20,000." In another, he frets about "stool pigeons." 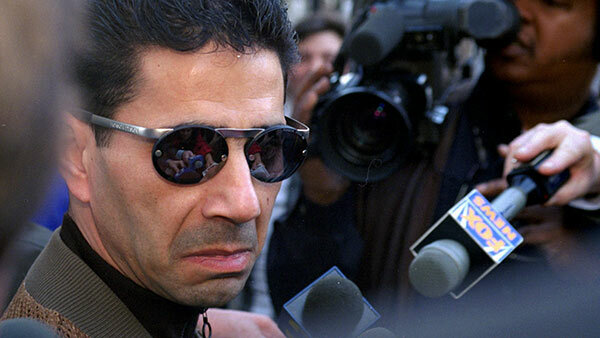 Merlino, 55, once controlled the remnants of a Philadelphia organized crime family that was decimated by a bloody civil war in the 1980s and 1990s. Federal authorities said he was frequently targeted by murder plots after rivals put a $500,000 murder contract on his head. In 2001, a jury acquitted Merlino and six co-defendants of three counts of murder and two counts of attempted murder that could have put him behind bars for life. He was convicted of lesser racketeering charges and served 12 years in prison. Merlino claimed he retired from the mob for good and started a new life by running an upscale Italian restaurant in Boca Raton, Florida. At the time of the alleged conspiracy, he was a gambling addict who took money from a cooperator because he was always broke, his lawyer said. There also was testimony from government witnesses, heard by his wife in the audience, that he drank heavily and that he had an affair with a pharmaceutical saleswoman. After the testimony about the fling, Merlino approached a New York Post reporter outside court and told him, "Don't put the girl in" a story, the tabloid reported. In another aside after the jury was picked, he predicted his trial would end in a "deadlock win" for him and offered what turned out to be a winning tip on the Super Bowl: "Oh, and bet the Eagles."